For those who don’t know, the pink ribbon has become a symbol to increase awareness about breast cancer. And the pink helix below is a representation of DNA. All in all, a nice poster! Annie Parker thought she had problems. Mary-Claire King thought she had answers. Two extraordinary women, one incredible true story! “Annie Parker (Samantha Morton) has a personal relationship with breast cancer. Her mother and her sister died of the disease and ultimately she is diagnosed with it too. Naturally affable with an offbeat sense of humor – even in the face of her own mortality, she struggles to hold her family and life together, as her body betrays her. I heard men can get breast cancer too. So is there a genetic link here too? Anyway, do you like Aaron Paul with long hair? 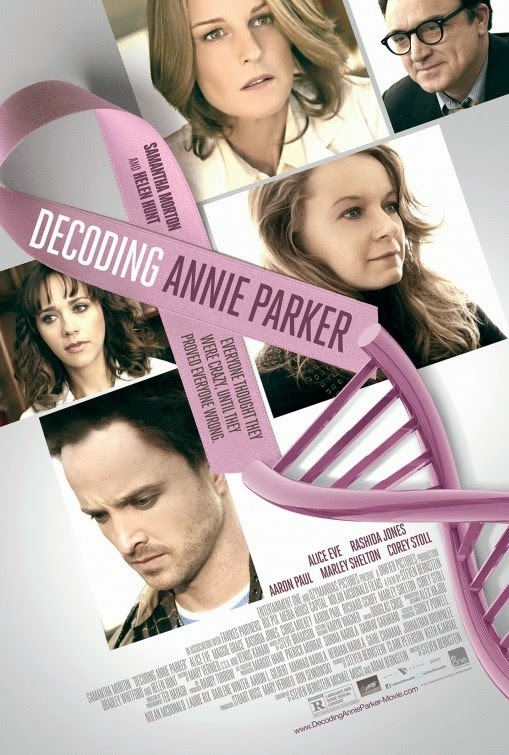 The release date of Decoding Annie Parker is set to May 2, 2014.